Rehearsal dates have now been arranged for the 2018 Diocesan Choral Festival. 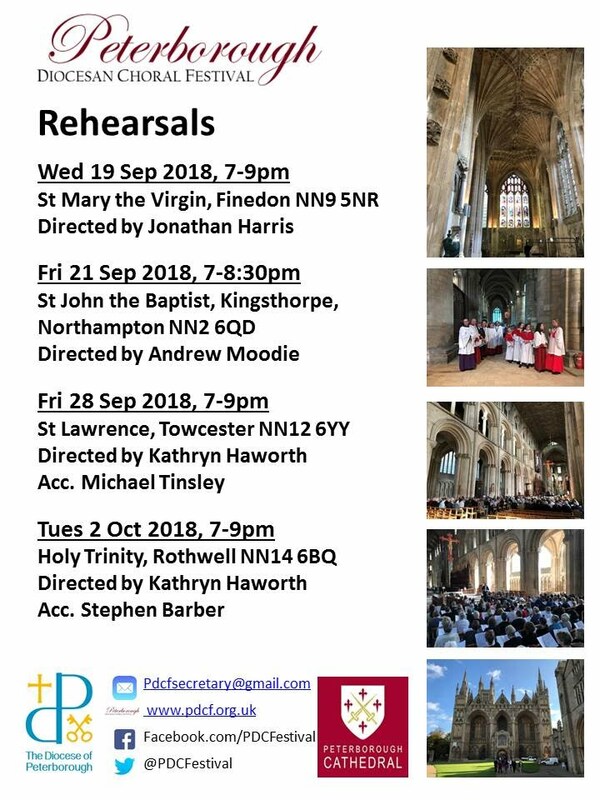 These are at various places across the diocese, please try and get to one of the rehearsals in addition to the main rehearsal at the Cathedral on 13 October. See the Area Rehearsals page for further information. I very much enjoyed today’s choral festival. As ever, your energy and commitment resulted in a most enjoyable service, and spoke of your on going ministry of music. My grateful thanks to the members of the working group, who have once again been tireless in their preparation and execution of the festival day. I would also like to extend warm thanks to those who directed rehearsals in their parishes, and to the conductors of the area rehearsals. Without this essential work, the festival could not run. It was great to be able to sing Lee Dunleavy’s responses, and I am always impressed by the way in which we tackle a wide variety of music with such aplomb. I am very much looking forward to seeing you next year: please save Saturday 13th October in your diary. The 2018 PDCF Music Launch will be held on 26 April, 2018 at 7:30pm at St Mary the Virgin, Church Hill, Finedon NN9 5NR. Festival booklets will be available to collect from 7pm. Booklets can be ordered via the website (once available). 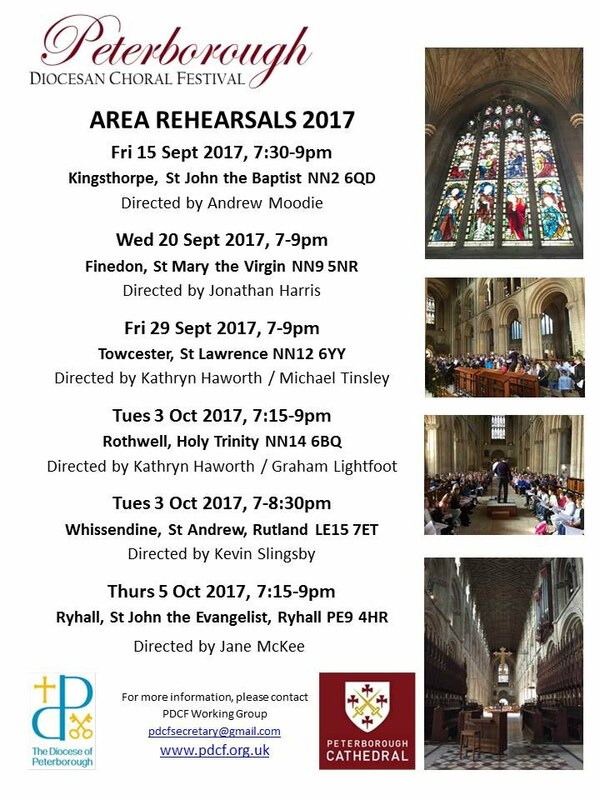 Check out where your nearest rehearsal is; visit the 'Area rehearsals page'; poster below and also available on download page. Dates for the area rehearsals have now been organised and are listed on the Area Rehearsals page. There may be other practices open to outside singers so please keep an eye on the web site for further details. Enjoy the summer - we look forward to seeing you and your singers at the rehearsals and at the festival.